Are you having trouble generating new leads for your lab products and services in Texas? Perhaps your marketing strategy is working fairly well, but you have room for more customers. There’s no easier way to increase sales for your biotech solutions than to exhibit at Biotechnology Calendar, Inc. life science marketing events. 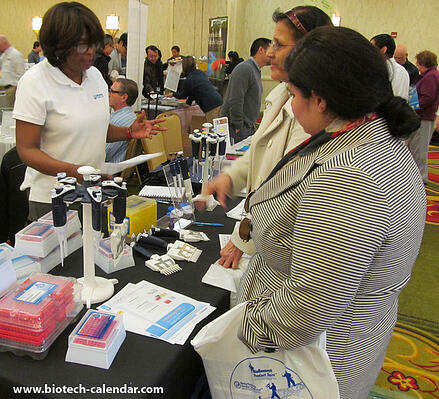 One of the most popular Biotechnology Calendar, Inc. events of the year is the Texas Medical Center vendor show. At this event, researchers are looking for and achieve success in finding the lab products and services they need. This year’s BioResearch Product Faire™ Event at The Texas Medical Center was also a success for many exhibitors, some of whom reported seeing as many as 300 attendees at their booth. One exhibitor reported 200 visitors to their booth with 100 good or excellent quality leads. Another exhibitor who estimated they had the same number of leads and visitors commented that the onsite staff were helpful and improved their experience of the event. Exhibitors in general remarked that they were very pleased with their table placement and that the event staff were attentive to exhibitor needs. One hundred leads out of 200 visitors is a promising percentage of leads. The exhibitors who reported these numbers must be excellent salespeople, but the reports are also a testament to the quality of the audiences Biotechnology Calendar, Inc. life science marketing events draw. Biotechnology Calendar, Inc. events stand out from similar events in that researchers and exhibitors are both able to meet their needs with greater satisfaction. How many leads can you expect to speak with in Texas? This year, the BioResearch Product Faire™ Event at The Texas Medical Center brought in 452 attendees. Of these attendees, 148 were qualified leads such as purchasing agents, professors, post docs and lab managers. 50 different research buildings and 79 on-campus departments were also represented at this event. If you would like to meet face-to-face with researchers and other life science professionals at the next BioResearch Product Faire™ Event at The Texas Medical Center, Biotechnology Calendar, Inc. invites to you to exhibit on January 29th, 2015. For more information on life science marketing events in other regions of the United States, click on the button below. *To protect confidentiality of our customer survey results, we list responses by price product category only.